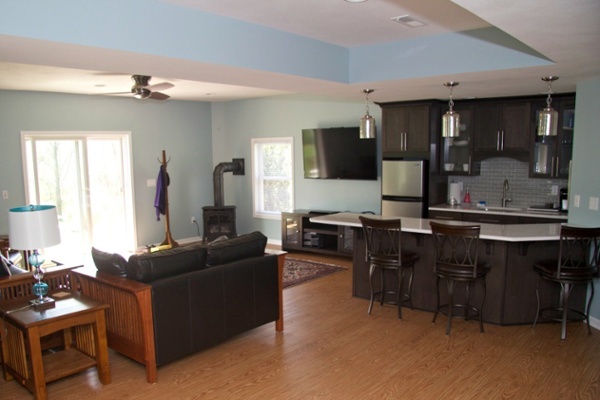 Home improvement specialists and realtors agree - one of the easiest ways to expand your home and add value is to use the space in your basement. Many basement conversions create highly functional entertainment areas for family and friends - everything from wet bars and wine cellars to home theaters and saunas. Contact us for a complimentary consultation. This lower level game room features a pool table. A three-lamp downlight hanging fixture was placed at a proper height to illuminate the surface of the table. There is also a rack on the wall to hold cues and carpeted flooring in the game area. 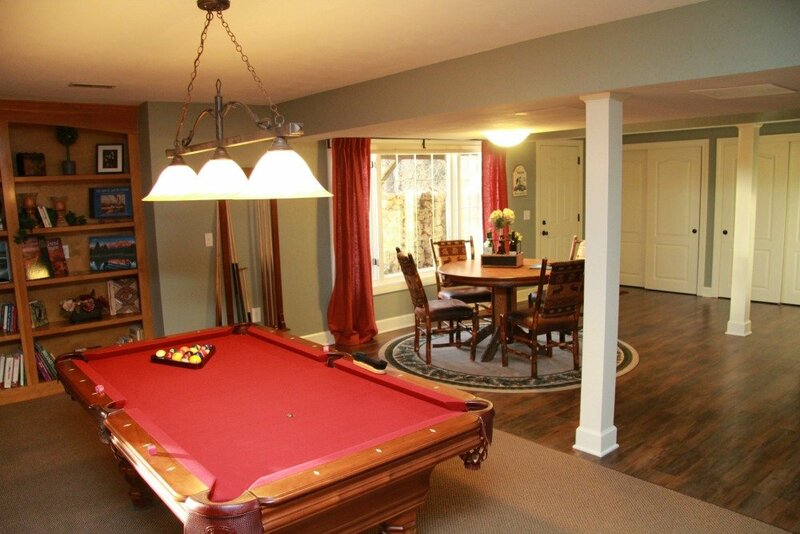 This lower level game room features a pool table and ping-pong table. 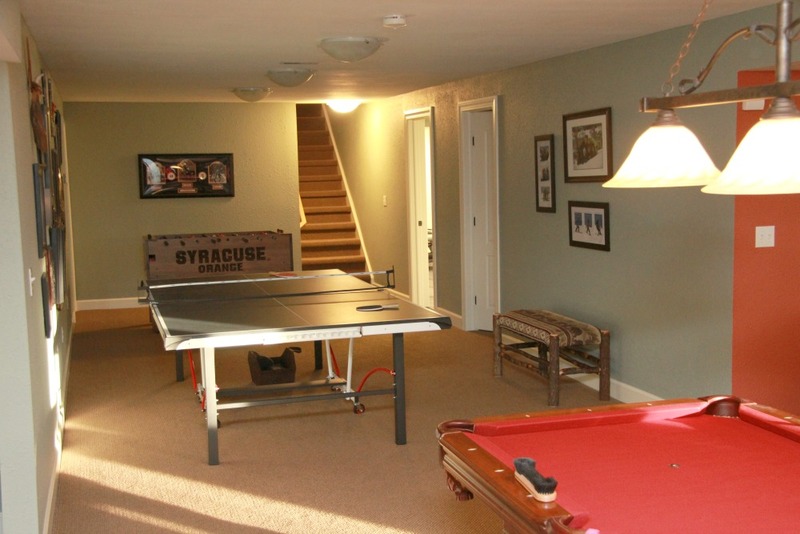 Three ceiling mounted lights were installed to illuminate the surface of the ping-pong table and a three-lamp downlight hanging fixture was placed at a proper height to illuminate the pool table. 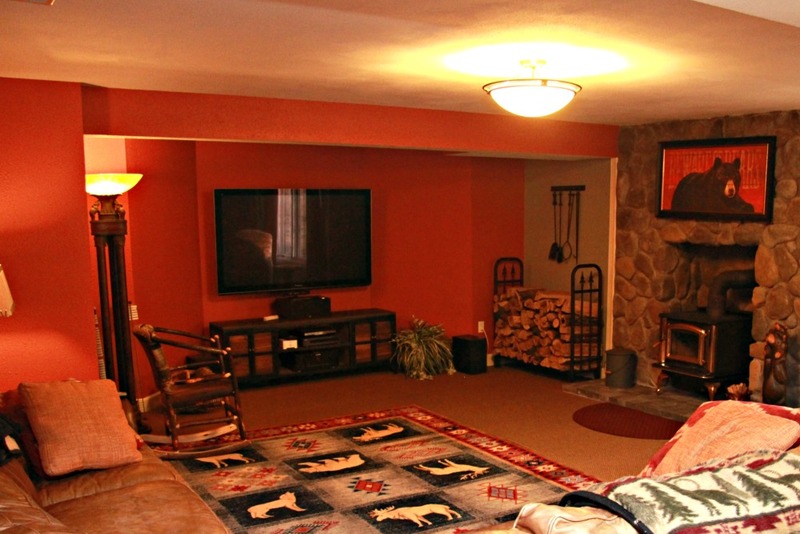 Walls in the theater area of this media room were painted red and new carpet was installed. A flat screen HD television is mounted on the wall of an alcove for optimal viewing and reduction of glare. A floor-to-ceiling stone wall and cast iron stove provide a focal point in the space. 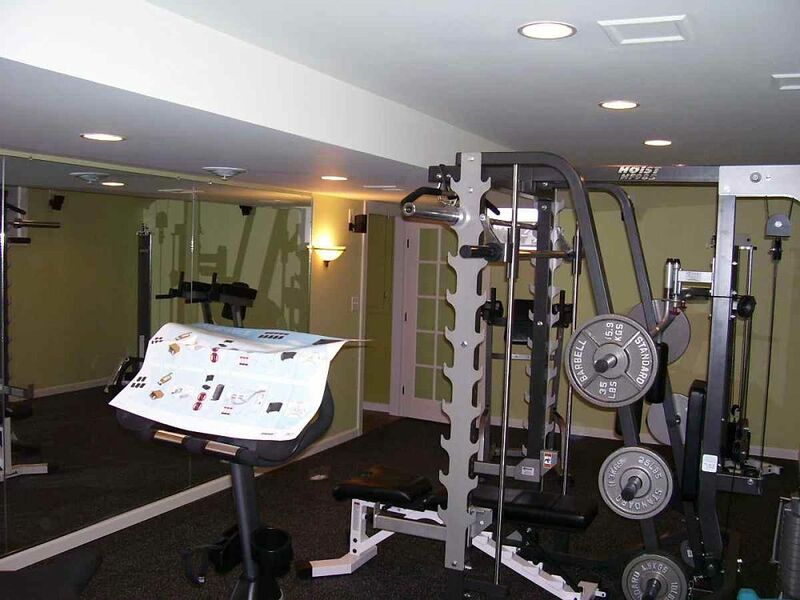 This lower level home gym includes a treadmill, universal, weight bench and an exercise bicycle. The specialized flooring provides cushioning for the exercise equipment. 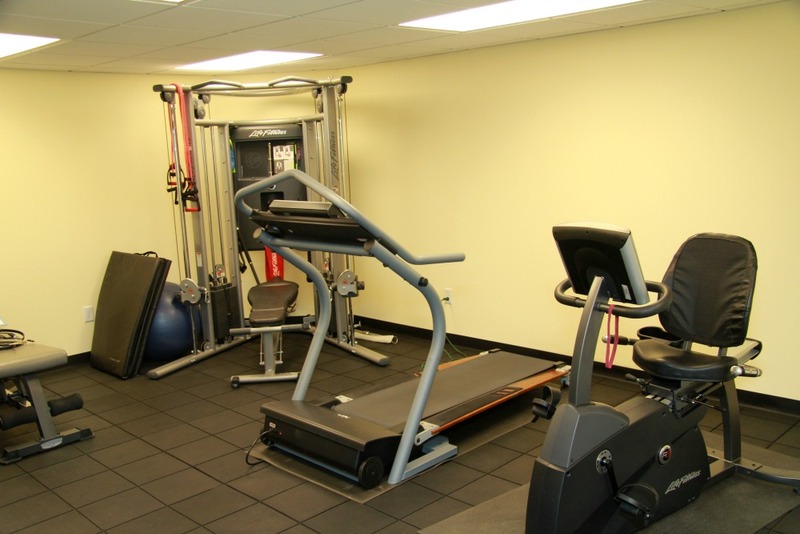 The ceiling has acoustical tile to provide access to mechanicals and quiet the sound during workouts. A coffered ceiling hides wires and plumbing in this lower level living space. Upscale vinyl flooring looks like wood and is easy to maintain. The kitchenette includes a bar area for food prep, serving and informal dining. A big screen TV is mounted on the wall for optimal viewing from the seating area. A corner gas fueled stove provides supplemental heat to the room and helps to lower humidity. 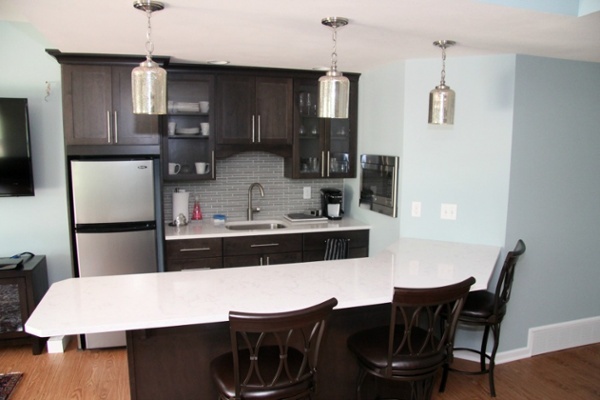 This stylish transitional basement kitchenette features dark stained cabinets, quartz counters and a mosaic glass tile backsplash. Upper cabinets with glass doors make contents easy to view. The brushed nickel cabinet hardware is sleek and functional. Drawer pulls double as towel bars. 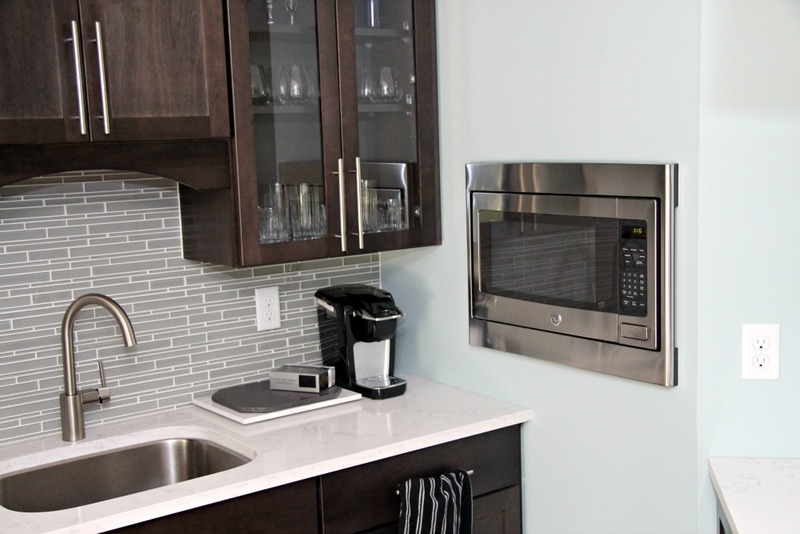 This basement kitchenette features dark stained cabinets, quartz counters, mosaic glass tile backsplash and a built-in microwave. 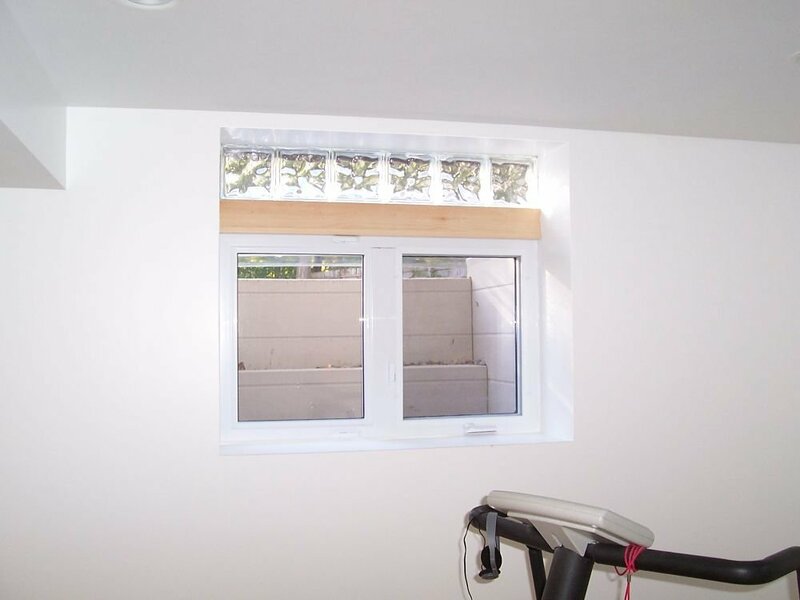 A window brings natural light into this basement bathroom and can be opened to provide ventilation. Flooring is slip-resistant tile. 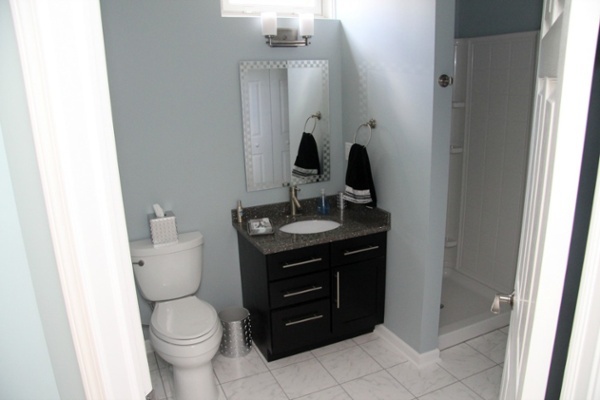 The Shaker-style vanity has a quartz surface and undermount sink. The mirror and uplight sconces add interest to the room. The homeowners also included a convenient walk-in shower. 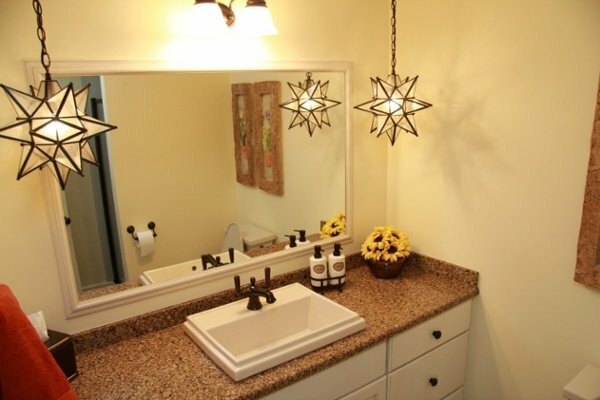 Star pendant lights add a whimsical accent to this lower level bath. A rectangular vessel sink matches the finish and lines of the mirror and cabinets. 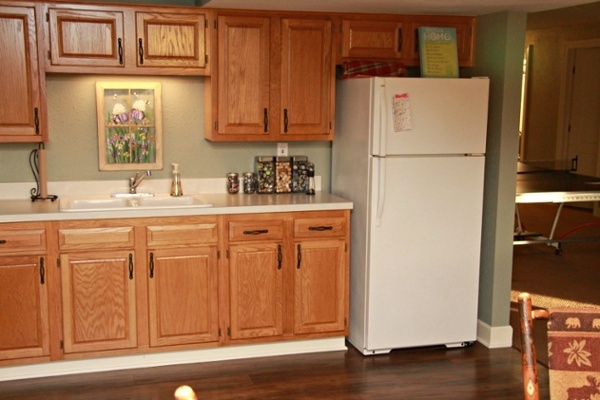 The kitchenette provides a space for preparing snacks and informal meals. Natural finish oak cabinets from Jim Bishop Cabinets were used. A Cambria countertop and backsplash are easy to clean. An undercabinet light illuminates the sink. 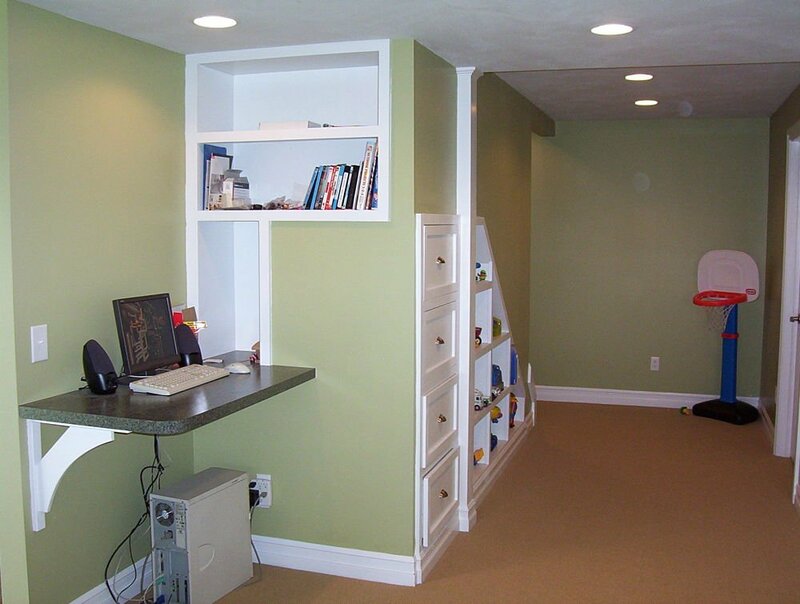 Cubbies and drawers were custom built underneath the stairs to this finished basement to create a place for toys and books to be neatly stored. A small countertop was installed to create a computer station. 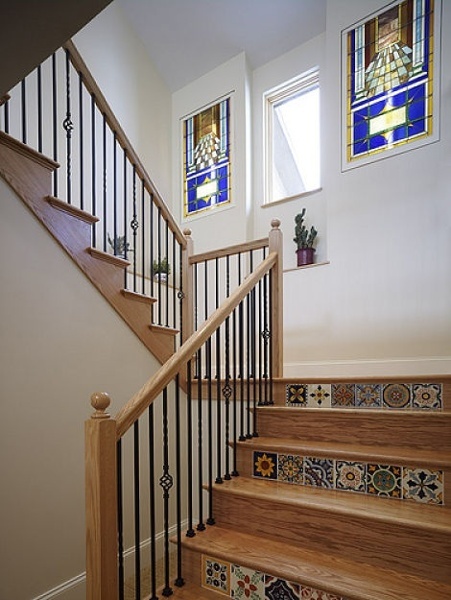 Tile from Spain inlaid into the risers and backlit stained glass add beauty and elegance to this unique custom staircase. This basement finish was designed and constructed to accommodate the owner's exercise equipment. The wall of mirrors makes the room feel larger. The interior side of this egress (exit) basement system allows more natural light and ventilation into the space. An attractive glass block transom adds style to this window.